Bill Adsett sent in a report of a scouting trip to Cerro Santiago he and Dave Klauber did on April 3–4. 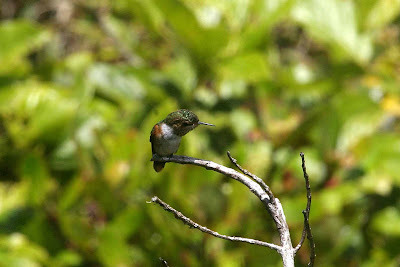 We saw a number of Glow-throated Hummingbirds. There were several on the Continental Divide in bright sunlight at 1618 m altitude UTM 0414657 - 0939884, 39.4 km from the San Felix turn-off on the Panamericana, about 1.5 km beyond the transmission tower. There were female(s), immature(s) and one very beautiful mature male. Terrible things to photograph though. 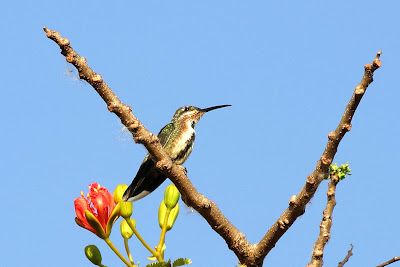 They were feeding at pink and red flowers on small plants and shrubs in open areas along the road. There was another individual (female or immature) in forest close to Ratón UTM 0412085 - 0942967. I got a tape recording of the Yellow-green Finch call which I shall share in due course. 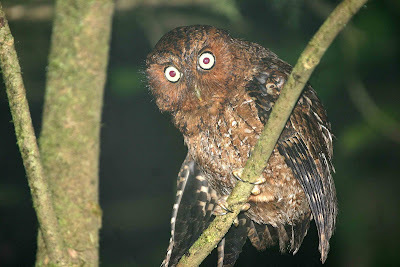 The Bare-shanked Screech-Owl in the photo was near Ratón, while the Veraguan Mango was in San Félix.